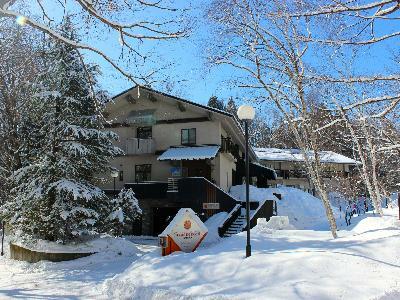 Situated on the base of Nakiyama Slope Marillen is a true Ski-in, Ski-out hotel. A warm and friendly with an Austrian theme with beautiful wood furniture and a crackling fire, ideal for families, groups of friends and couples. Large picture windows provide stunning panoramas of the Happo-One by day and night while listening to live music and warming up with Gluhwein and other treats! A large room suitable for families or groups with four beds and small lounge area, plus private ensuite. Cost of accommodation based on 2 guest(s) arriving 2019/12/19 and staying 7 night(s). Cost includes a 3.3% discount on the standard rate. Please note discounts may be available for a limited time and conditions may apply. Western style bedding with a choice of either two single beds or a large double bed plus ensuite. Cost includes a 3.6% discount on the standard rate. Please note discounts may be available for a limited time and conditions may apply. A room suitable for families or groups with four beds, plus private ensuite. Western style bedding with a choice of either two single or a large double bed plus ensuite. Cost includes a 2.9% discount on the standard rate. Please note discounts may be available for a limited time and conditions may apply. Cost includes a 3.4% discount on the standard rate. Please note discounts may be available for a limited time and conditions may apply. Relax in our steam saunas & Japanese baths or unwind with a traditional Japanese massage in the comfort of your room. Mimi’s, our gorgeous in-house restaurant, provides exquisite meals using the best local produce with an extensive wine and sake list. 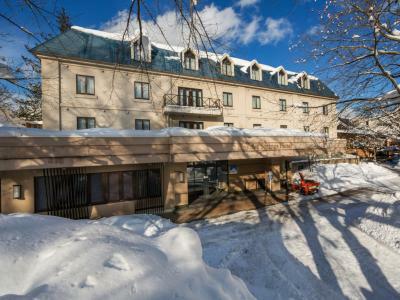 We can assist with local attractions, tours, ski hire & transfers. It is all the small things we do at the Phoenix Hotel that make the difference. Cost includes a 15% discount on the standard rate. Please note discounts may be available for a limited time and conditions may apply. 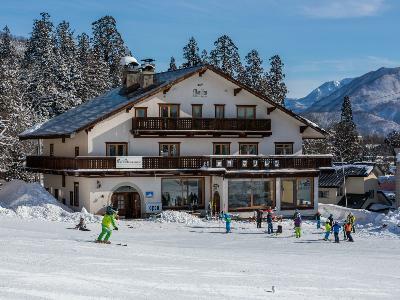 Stay in one of our best-rated hotels conveniently located in the heart of Happo Village and only minutes walk from the main Happo gondola. Choose from a variety of room types from comfortable Western Rooms or Traditional Japanese and soak in our in-house onsen and sauna. After a thrilling day on the slopes indulge in Hakuba’s finest Japanese Izakaya and Sushi Restaurant, ‘Sharaku’. Western style bedding consisting of two single beds or a large double in a spacious room with an ensuite. Three large single beds and an ensuite make this a great room for a group or small family. Cost includes a 3.2% discount on the standard rate. Please note discounts may be available for a limited time and conditions may apply. Western style bedding consisting of two single beds and a lounge and ensuite. Western style bedding consisting of two single beds with the option of adding an extra bed or sofa bed. The room also contains a lounge and has an ensuite. JW or JNR Suite with twin beds, and Japanese style tatami futons which can be used for up to four persons to sleep comfortably. The room also contains a large screen TV and lounge area, plus ensuite. Cost includes a 3.1% discount on the standard rate. Please note discounts may be available for a limited time and conditions may apply. Large room with divider which can be used to separate it into two areas. Western Beds can be configured as 2xKings, 4x Single or 1 King & 2 singles. Room also contains a large screen TV and ensuite. 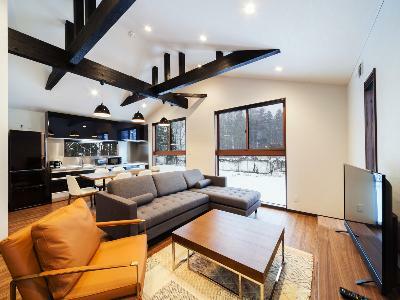 Phoenix 3 Bedroom Chalets - 116 Square Metres plus 26 Square Metre Decks The Phoenix 3 Bedroom Chalets are two storey, 6 person (Asama, Chikumagawa) apartments with 3 large bathrooms, a huge bath to soak in with luxurious modern interiors. Bedding Configuration: 1 x king bed in the master bedroom, 1 x king bed in the second room, 2 x single beds in the third bedroom plus 3 bathrooms. 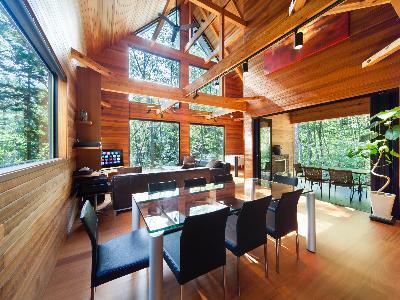 Situated only 500 meters from the Nakiyama slopes of Hakuba's largest resort Happo One. Mizuho Chalets are designed for families and groups of friends after a quality self-contained chalet at value rates in a fabulous location. 3 bedrooms(1 ensuite), 2 showers, 2 toilets, 1 bath, lounge & dining, hydronic underfloor heating, complimentary WIFI system kitchen, dishwasher, oven, toaster, cooktop, refrigerator/freezer, microwave, crockery, Barista coffee machine LCD TV w/ local channels, DVD player, sound system, laundry washer/dryer, ski/dry room, ample parking. Cost includes a 1.9% discount on the standard rate. Please note discounts may be available for a limited time and conditions may apply.